Did that 49ers-Saints game this past weekend really happen? I'm having doubts. I watched it, and I know Josh watched it. But my Twitter feed, which usually lights up for big sporting events, stayed quiescent even as the lead changed hands four times in the final four minutes. Everyone was saving their attention for the late game from Foxboro, where Time, The New Yorker, GQ, and People all had credentials to watch Tebowmania bite the dust. So the Niners game—a stirring battle between the NFL's best defense and a record-setting offense, capped by an unimaginable shootout—failed to make a dent in the collective football consciousness. I turn now to the experts making predictions for the NFC championship game. On CBS Sports, five out of five panelists have picked the New York Giants to beat the 49ers. Over on ESPN, six out of 10 picked the Giants. Our own roundtabler Brian Burke is on the New York Times website saying the Giants should be favored. Las Vegas won't go quite as far as Brian; the betting line favors San Francisco by 2.5 points. But this is a team that went 13-3 in the regular season, whose worst defeat was a 16-6 loss, with the two other losses by two points and three points. The 49ers will be playing at home, hosting a Giants team that went 9-7, nearly missed the playoffs, and has been beaten by as many as 25 points—and which already lost in San Francisco this year. Yet Vegas, in calculating the mood of the gambling public, sees all those advantages as adding up to less than a field goal. What makes the 49ers such a tepid favorite? There seem to be two main theories about this matchup. One is that the Giants are on their way to duplicating, four years after the fact, their last shocking underdog run to the Super Bowl—that despite a thoroughly mediocre regular season, fate and health and chemistry and a rampaging defensive line have all come together in a way that transcends the Giants' actual record, so that more qualified-seeming teams will part before them like the Red Sea, making them champions again. The other theory is that the 49ers, after years of awfulness and obscurity, won 13 games by being a good football team. Between the two, the magical-thinking scenario somehow strikes people as more plausible. Sure, the Giants went out last week and routed the defending Super Bowl champions, battering the league's highest-scoring offense into total disarray. They were impressive. But New York was supposed to have a great pass defense. The Niners, meanwhile, didn't blow out the Saints—instead, Game-Managing Quarterback Alex Smith traded big scoring plays with Drew Brees and the pinballing Saints, showing a dimension to the team that even San Francisco's believers hadn't ever expected to see. Still, the 49ers have been so bad for so long, it's hard to believe things have really changed. They play on the West Coast, so it's been possible to miss their games if you don't go looking. Seeing them reappear on my TV this season, wearing their familiar red, gold, and white, has been unsettling, like hearing an old popular song you'd forgotten 20 years ago. One's frame of reference wobbles. Last week's shootout (and the occasional heroic quarterback touchdown run) aside, these aren't the Steve Young Niners. San Francisco did have the league's fourth-highest scoring margin in the regular season, outscoring opponents by 151 points. But "outscoring" is a little misleading. The teams ahead of the 49ers on the list—Green Bay, New Orleans, and New England—got there by lighting up the scoreboard. 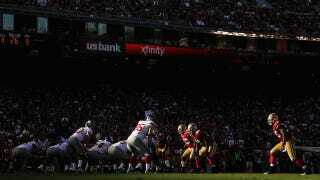 The 49ers got there by unplugging the scoreboard. Their opponents averaged 14.3 points per game, or 60 percent of San Francisco's scoring output. No one was more dominant than that, percentage-wise. The overwhelming reason the 49ers won 13 regular-season games and find themselves where they are today is turnover rates—historically good turnover rates, to be exact. Alex Smith's interception rate is the best in the league at 1.1 percent, and the team fumble rate is second in the league at 1.5 percent. Their defensive interception rate is fourth best in the league, at 4 percent. Turnovers are the least consistent, most random aspects of team performance, which is why my efficiency model puts the Giants as the superior team, enough so to make them the favorites on the road Sunday. The 49ers led the league in turnover margin this season with a startling plus-28, a performance that should inspire some skepticism. As Brian wrote, turnovers have a huge element of randomness. Turnover margin tends to vary erratically from year to year. But a team's turnover margin is made up of different things, some of them less random than others. Smith has thrown five interceptions, while San Francisco's defense has grabbed 23. The size of that gap is probably exaggerated by random chance, but the gap is there for good reasons: San Francisco plays a conservative offense; Smith's league-best 1.1 percent interception rate goes with his 3.8 percent touchdown rate, good for 22nd place. The Niners avoid risk and reward alike. Where chance truly matters is when the football hits the ground. San Francisco is credited with forcing 20 fumbles in the regular season, and its opponents fumbled 11 other times without being forced (according to Elias). Of those 31 total fumbles, the 49ers recovered 15, or 48.4 percent. Compare that with the Baltimore Ravens, another defense-first team famous for its ball-hawking. Baltimore forced 21 fumbles, but their opponents had only six unforced fumbles. The Ravens ended up with 11 fumble recoveries, or 40.7 percent. Relative to the Ravens, the 49ers were lucky. But the 49ers aren't playing the Ravens this weekend. They're playing the Giants, who recovered 52.4 percent of their opponents' fumbles in the regular season. Add in each team's own fumbles on offense or special teams—the Niners lost five of 14; the Giants lost eight of 18—and their playoff performances, and San Francisco has recovered 29 of 51 loose balls, while the New York has recovered 24 of 42 (or 25 of 43 if you count Greg Jennings). That's 56.9 percent for the 49ers, 57.1 percent for the Giants. So, yes, from a statistical perspective, there's reason to discount the 49ers' true merit as a football team. But not their merit relative to the Giants. The 49ers are lucky to be 14-3. The Giants are lucky to be there at all.